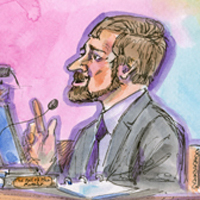 On the fifth day of trial, psychologist Michael Lamb testified as an expert on the developmental psychology of children, including the developmental psychology of children raised by gay and lesbian parents. Lamb is a professor and head of the Department of Social and Developmental Psychology at the University of Cambridge in England. He testified that the children of gay and lesbian parents are just as likely to be well-adjusted as children raised by heterosexual parents, and that the children of gay and lesbian parents would benefit if their parents were able to marry. “I’m going to offer two broad opinions. The first is that we have a substantial body of evidence documenting that children raised by gay and lesbian parents are just as likely to be well adjusted as children raised by heterosexual parents. “[A] substantial consensus has developed over the last 30 or 40 years of research documenting that the factors that affect children’s development fall broadly into these three broad categories of factors that are summarized on your overhead. The first of those is the quality of the relationships that children have with their parents or the people looking after them. There is a large body of evidence showing that children are better adjusted when they have good, warm, close relationships with parents who are committed to caring for them and looking after them, and that children’s development is conversely hindered when they don’t benefit from such relationships with people offering such parental behavior. The second set of factors have to do with the relationships between the individuals who are raising the child. And, again, here we have a large number of studies showing that children’s development is adversely affected when there is conflict between those individuals. And, on the other hand, that children benefit from being in a situation where those adults have harmonious relationships with one another. Well, I think those articles are representative of a much larger body of research focused on this question documenting very conclusively that children who are raised by gay and lesbian parents are just as likely to be well-adjusted as children raised by heterosexual parents. That’s a conclusion that has been documented in studies using, as I said, a variety of methods, a variety of ways of obtaining samples, asking different sorts of questions about various aspects of adjustment involving children and adolescents of different ages. And the conclusiveness of that evidence is, in my mind, further supported by the fact that the results obtained in the studies that involve gay and lesbian parents are completely consistent with our broader understanding of the factors that affect children’s adjustment, as I explained at the beginning of my testimony.